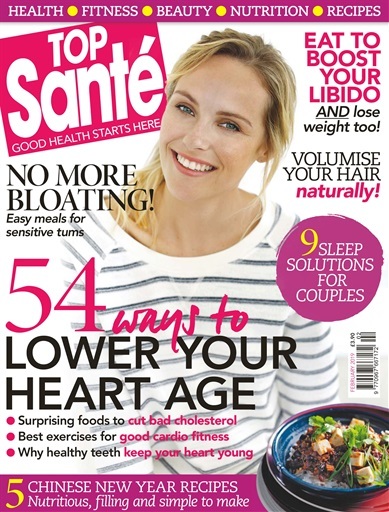 Go find a copy of this month’s Top Sante packed full of great things including easy meal ideas for reducing bloating, tips for lowering your heart age including foods to cut bad cholesterol and recommended exercises for improved cardio fitness, some delicious and nutritious Chinese New Year recipes, sleep solutions for couples and eating to lose weight and boost your libido. The issue offers some great advice for making this month ‘your healthy February’ by getting fit, dressing to impress, getting to bed earlier and reading books that will connect you to nature such as The Wild Remedy: How Nature Mends Us-A Diary by Emma Mitchell, The Salt Path by Raynor Winn and The Almanac: A Seasonal Guide to 2019 by Lia Leendertz. They recommend InnTravel.co.uk for slow, self-guided walking, cycling and touring holidays. It suggests that we boost our spirits this month by shifting from ‘mindfulness’ to ‘kindfulness’ and feel the power of reaching out to those around us. I’m one of the Top Sante Team experts, and on page 83 you will find this month’s advice on how Tai Chi can help you get fit, the differences between indoor and outdoor gyms and what to do to make the most of an outdoor gym. For Mind Body Coaching support visit Energised Performance. Sign up to my Sunday Newsletter for Quick Mindset & Fit Performance Tips and special offers here. « Bare Biology Lion Heart Maxi is now available!